In June 2018, we released the first-ever ‘live’ global view of likely transshipping at sea. Data released on our map reveals in near real-time the location, time and identity of thousands of vessels involved in close encounters at sea. Fishing boats and refrigerated cargo vessels meet at sea in order to transfer seafood, crew, fuel or supplies. Known as transshipment, the practice enables fishing boats to remain at sea fishing for months to years at a time while still getting their catch to market. The visualisation is a first step towards greater transparency in transshipping. The new data reveals potential transshipment hotspots. Vessel encounters cluster at the boundaries of many Exclusive Economic Zones (EEZs), particularly in international waters surrounding Africa, South America and many Pacific nations, just outside their national jurisdiction. They also occur frequently within the EEZs of some west African nations and other regions with laxer management and enforcement. The data does not suggest illegality, but it does reveal a pattern of where transshipment occurs and encourages discussion. To detect pairs of vessels meeting at sea, Global Fishing Watch and analysts at SkyTruth and Google, applied machine learning algorithms to more than 30 billion Automatic Identification System (AIS) messages from ocean-going boats to find tell-tale transshipment behaviour, such as two vessels alongside each other long enough to transfer catch, crew, or supplies. AIS is a collision avoidance system that constantly transmits a vessel’s location at sea. These transmissions are collected by satellite receivers and delivered to Global Fishing Watch for automated processing. Nearly all refrigerated cargo vessels carry AIS and those ships receiving fish can be identified and their activity plotted on our map. Our 2017 transshipment report identified and mapped more than 5,500 likely rendezvous over a 5-year period. It is the first global footprint of such rendezvous ever published. In addition, the algorithm we developed to detect likely transshipments is being used to identify suspicious rendezvous for further investigation. In August 2017, for example, when a reefer was caught illegally transporting tons of shark through Galapagos waters, our analyst traced its behavior to find it had likely transshipped them from four fishing vessels just days earlier. 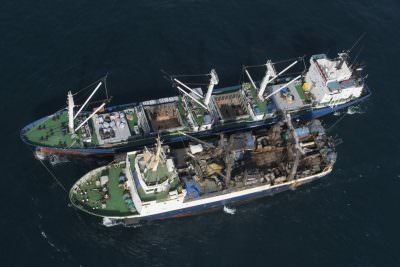 The discovery exposed the behavior of fishing vessels that would previously have gone undetected. In July 2018, we expanded on our report with two publications. “Identifying Global Patterns of Transshipment Behavior,” a collaboration with our partners at SkyTruth and Google, was published in Frontiers of Marine Science and was the first-ever global assessment of transshipment in a scientific journal. Read our blog post from analyst Nate Miller to learn more about the results. “Global hot spots of transshipment of fish catch at sea,” a study written by our partners at SkyTruth and Dalhousie University, was published in Science Advances in July 2018 and built upon our study to identify for the first time the fishing vessel types and fisheries most involved in transshipment, as well as what proportion of high seas catch is transshipped versus landed directly. Our analysts and data scientists continue to search the data to find patterns and associations that reveal where transshipment occurs and how different fleets engage in the behavior. Our efforts can provide important insights to inform any future transshipment policies. With a fleet of millions of fishing boats operating in every corner of the globe, often hundreds or even thousands of miles from land, we need greater transparency in order to tackle many of the problems we see on the oceans. Global Fishing Watch is an amazing resource to shine light on what’s happening at sea, and [their transshipment report] gets at the sheer scale of the picture that’s difficult for people to conceptualize. Transshipment involves refrigerated cargo vessels (reefers) gathering catch from multiple fishing boats while at sea for transfer to port. They are, in effect, floating ports but far less regulated. Transshipment can enable laundering of illegal fish by mixing it with legal catch. It can enable fishers to steal fish from one country’s waters, and it skews estimates of the global seafood harvest. It is also associated with human rights abuses, such as slave labor on fishing vessels, as the boats rarely need to return to port.